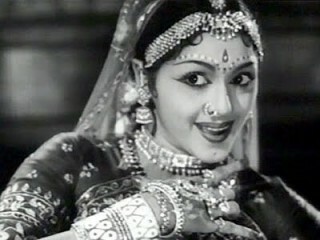 Padmini was an Indian actress and trained Bharathanatyam dancer who acted in over 250 Indian movies. "Padmini" in Sanskrit means "She who sits on the lotus" and refers to the goddess Lakshmi. It is common for people to be named after deities in India, and this actress is today more well known than Padmini as a form of the Goddess. Apart from Hindi she also acted in films in other Indian regional languages viz. Tamil and Malayalam. She was fluent in all of the four mentioned languages, and was able to use her own voice to dub the films between these languages. She became the most popular actress and dancer of the Tamil film industry and most of her movies are shot in Tamil. Padmini was born and raised in Thiruvananthapuram in what was then the princely state of Travancore (now the Indian state of Kerala). She was the second daughter of Thankappan Pillai and Saraswathi Amma. Her sisters, Lalitha and Ragini, were also well known film actresses. Together, the three were known as the Travancore sisters. Padmini and her sisters learnt bharathanatyam from Vazhuvoor B. Ramaiah Pillai. The trio was also the disciples of Indian dancer Guru Gopinath. They learnt "Kerala Natanam" style of dancing from him. Film director P. Subramaniam, noticed her talents while she was presenting Parijatha Pushpapaharanam in Thiruvananthapuram. Best actress award from Film Fans Association in 1954, 1959, 1961 and 1966.